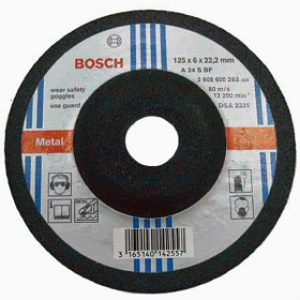 Bosch Flap Disc 100mm 120gritBosch Flap Discs flap discs are used for light stock removal, blending and finishing all in one application. 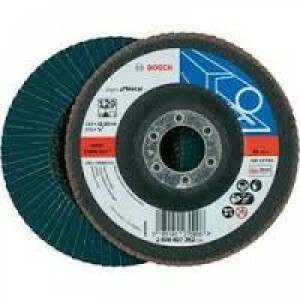 They grind like a depressed center wheel (DC grind wheel) and finish like a fibre disc (sanding disc)H..
Bosch Flap Disc 100mm 60gritBosch Flap Discs flap discs are used for light stock removal, blending and finishing all in one application. 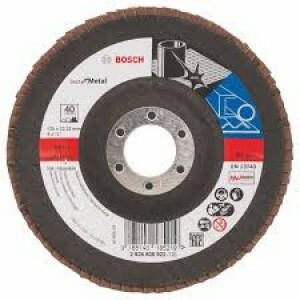 They grind like a depressed center wheel (DC grind wheel) and finish like a fibre disc (sanding disc) –..
Bosch Flap Disc 100mm 80gritBosch Flap Discs flap discs are used for light stock removal, blending and finishing all in one application. 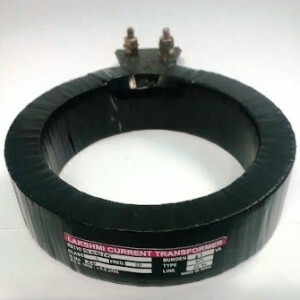 They grind like a depressed center wheel (DC grind wheel) and finish like a fibre disc (sanding disc) H..
Bosch Flap Disc 115mm 40gritBosch Flap Discs flap discs are used for light stock removal, blending and finishing all in one application. They grind like a depressed center wheel (DC grind wheel) and finish like a fibre disc (sanding disc) – hel..
Bosch Flap Disc 115mm 60gritBosch Flap Discs flap discs are used for light stock removal, blending and finishing all in one application. They grind like a depressed center wheel (DC grind wheel) and finish like a fibre disc (sanding disc) – hel..
Bosch Flap Disc 100mm 40gritBosch Flap Discs flap discs are used for light stock removal, blending and finishing all in one application. 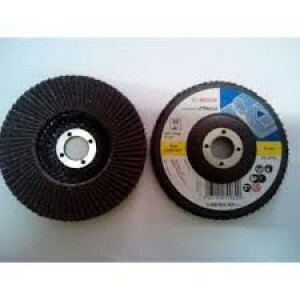 They grind like a depressed center wheel (DC grind wheel) and finish like a fibre disc (sanding disc) H..
Bosch Flap Disc 115mm 80gritBosch Flap Discs flap discs are used for light stock removal, blending and finishing all in one application. 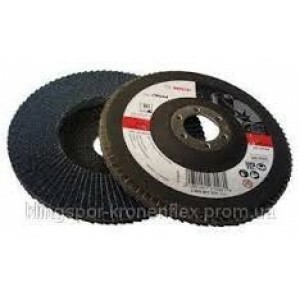 They grind like a depressed center wheel (DC grind wheel) and finish like a fibre disc (sanding disc) – hel..
Bosch Zircon Flap Disc 125mm 120gritBosch Flap Discs flap discs are used for light stock removal, blending and finishing all in one application. 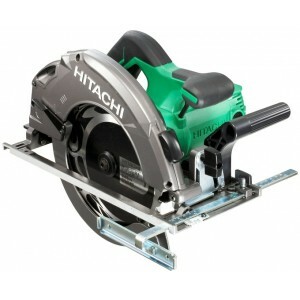 They grind like a depressed center wheel (DC grind wheel) and finish like a fibre disc (sanding disc..
Bosch Zircon Flap Disc 125mm 40gritBosch Flap Discs flap discs are used for light stock removal, blending and finishing all in one application. They grind like a depressed center wheel (DC grind wheel) and finish like a fibre disc (sanding disc)..
Bosch Zircon Flap Disc 125mm 60gritBosch Flap Discs flap discs are used for light stock removal, blending and finishing all in one application. They grind like a depressed center wheel (DC grind wheel) and finish like a fibre disc (sanding disc)..
Bosch Zircon Flap Disc 125mm 80gritBosch Flap Discs flap discs are used for light stock removal, blending and finishing all in one application. They grind like a depressed center wheel (DC grind wheel) and finish like a fibre disc (sanding disc)..